Free Red-eye Reduction Tool is a photo correction tool. 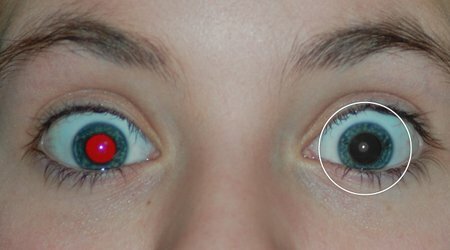 With this Red-eye Reduction Tool you can remove a common "red-eye" effect from your digital photos with very simple steps. Just use your mouse to drag and select one red-eye, then all unwanted effect will be fixed automatically. You can remove red eye from an image using the Red-eye Reduction tool very easily. The red eye reduction tool automatically changes the saturation and brightness of the area you selected without removing detail from the image. Zoom in to proper size to get a better view. Drag from the center of the red pupil. Drag the “Pupil Size" slider to increase or decrease the size of the area corrected. Drag the “Darken" slider to the left to reduce the darkness of the pupil area corrected. To change the selection size, drag the handle on the circle. To reposition the correcting area, drag in the circle. To remove one red eye change, select the red eye circle and press [Delete]. Click “Reset" in the panel to removes all previous operations.